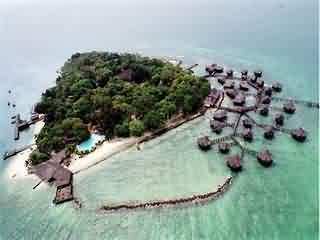 Bidadari(Heavenly Nypmph) Island is one of the resorts in the Seribu(A Thousand) Islands District, Jakarta. The island was previously knwon as Sakit(Sick) Island and Purmerend Island. It does not require a long time to travel to this island since it’s still adjacent to the Jakarta mainland. From the dock marina Taman Impian Jaya Ancol, the route to the resort only takes half an hour by speedboat belonging to the manager of the island. Because the location is so close to Jakarta, visitors can also come to this resort using jetski. There are at least two to three times departure from Marina Ancol jetty and from the Island. There are most departures on Saturday while on weekdays it’s usually only two departures scheduled. Along the way to this resort, visitors can witness the group of islands full of such historical places like Cipir Island (Kahyangan Island), Onrust and Kelor. These islands had been used by Dutch East India Company long time ago, so there are many Dutch heritage buildings look like fortresses and ancient dock. In the 17th century, this island is a supporting Island for activity on Onrust Island because it was not far away from it. Because of it, there were also built some means of support on it. In 1679, the Dutch built a hospital for, which was moving from Angke. Therefore, this island was once named Sakit(Sick) Island. At the same time, the Dutch established the fort. The fort was built as a means of supervision to conduct the defense from the enemy attacks. Before the Island was occupied by Dutch, Ambon and Dutch people have lived on the island together. Around the year 1800, the British fleet attacked the island and destroyed the buildings on the island. In 1803 the Dutch regained control of the Island and rebuilt. However, the British attacked again in 1806, Onrust Island, Bidadari Island and other islands were crumbled. In 1827 the island was rebuilt by the Dutch with the involvement of the Chinese workers and prisoners. The building was a dormitory for pilgrimage that was still functioning until 1933. This island was empty and uninhabited before the resort built in 1970. In fact, the island has never been visited by people. In the early 1970s, the Seabreez co. started to manage this island to serve as a tourist resort. Since 1970, to attract visitors, the island changed its name to Bidadari Island. It was inspired by the name of the other islands in the Thousand Islands such as the Princess island, Nirvana Island, and others. 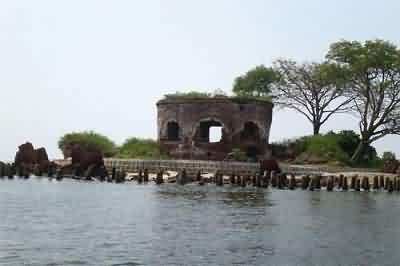 Historical relics from the Dutch colonial era are the main attractions at Bidadari Island. It’s also offering tourists to stay while enjoying the relaxing atmosphere of the sea. Because of the close location to Jakarta, many visitors who came are prefer to not staying or better known as the One Day Tour. Visitors who come here usually just want to relax and enjoying the cool sea breeze, while witnessing the historical buildings. 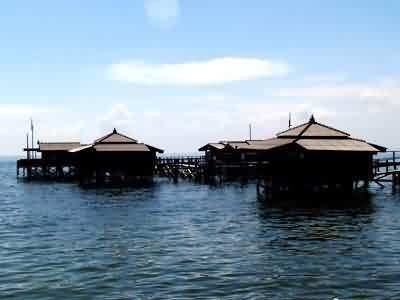 Unlike other resorts, resort Angel Island has floating cottages. It’s a house on stilts above the water like a fishing village. There are also cottages on land that consists of two models: the stage models and the regular model. The stage cottages are designed similar to the traditional house of Minahasa. The Island provides water sport facilities like banana boat, jetski, canoe or sea kayak and a number of other activities such as fishing and swimming at the beach. There are a number of marquees for a seat to relax or just lie down and enjoy the cool coastal breeze. Bidadari Island resort also has gardens under the shade of the trees so no need to worry about overheating.